Novellas are a tough sell. Unless they’re folded into a larger collection, Stephen King-style, they tend to get passed over in the bookstore. After all, they’re not that much cheaper than a regular book, and your list is only getting longer, so why not invest in something that’ll take a little more time, and hopefully offer greater reward? Digital sales have helped this conundrum a bit by lowering costs, but there’s still a mental resistance (for me, anyway) to purchasing a stand-alone middle ground between novel and short story. I’ve been trying to overcome this prejudice in recent years, and now I’ve got one of the best arguments for delving into the world of novellas. 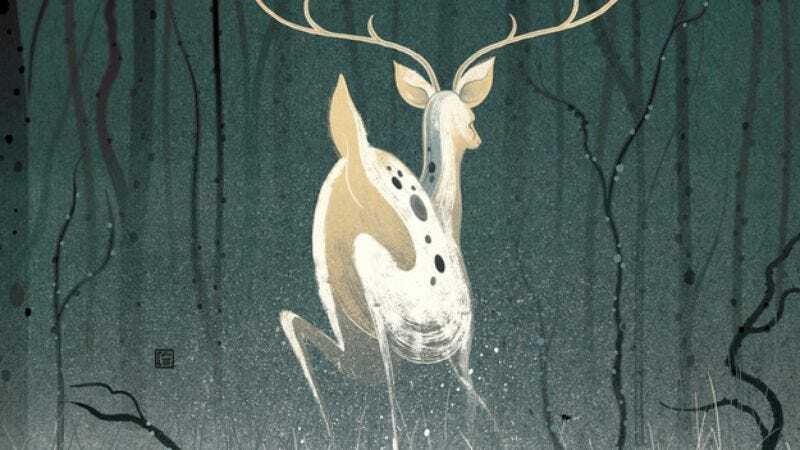 Forest Of Memory, by Mary Robinette Kowal, is a moving and eerie story. It’s over in just 96 pages, but it’s been lingering in the back of my mind for almost two weeks now; I keep turning over the ideas and emotions it triggered in me, so the damn thing is doing something right. It’s a first-person recounting of an abduction and hostage situation, set in a recognizable but technologically much different near future, one where most people have a constant AI connection to the world around them. Katya, a dealer in “authenticities and captures,” sells used goods to people nostalgic for access to authentic, handmade goods. But when her AI fails her, she’s stuck recounting her story herself, with no proof of the man who takes her prisoner in the woods for several days. It raises questions of memory, identity, and the role of narrative in our lives, with Kowal’s simple but suggestive prose evoking a mood almost fairy tale-esque in its minimalism, but profoundly complex in its philosophical inquiry. I’d happily push this book on anyone looking for smart but swift reading that will stay with you well after you finish it. My summer reading habits tend to be haphazard in the best way, as I find myself with more time for reading—mostly at the beach—meaning I’m able to grab more titles. Yet some of my most diverse reading still happens in my apartment—mostly on the days when the rain keeps me inside. That’s when I concentrate on the type of books that are too cumbersome to tow to the lake. Coffee table books, like Ron Faiola’s Wisconsin Supper Clubs: Another Round, are perfect for poring over on a sturdy table. After devouring Wisconsin Supper Clubs: An Old-Fashioned Experience, a beautifully photographed book that any history buff or foodie will enjoy, I anxiously awaited its sequel. Another Round follows the same pattern as the first, pairing endearing histories with intriguing photographs of the regional specialities, offering information on 50 additional supper clubs across Wisconsin. Both books make great companions for some Midwest road-trip planning. Lastly, because I like to keep things a little morbid no matter the weather, I read the graphic novel Death Follows and the children’s book Samira And The Skeletons. Dark Horse’s Death Follows comes from Cullen Bunn, the writer behind the Harrow County comics. Both titles are adapted from prose stories and each evoke a horrifying atmosphere, heavy on creating small, rural towns with dark secrets. Illustrated by A.C. Zamudio and colored by Carlos Zamudio, the graphic novel is filled with chilling imagery as the protagonist, Birdie, recounts certain strange events from her childhood involving reanimation. Samira And The Skeletons, by Camilla Kuhn, aims to avoid the horror that a child might associate with the body by allowing Samira to work through the fear she encounters after discovering everyone has a skeleton inside them. Light on biology lesson and heavy on dark humor, this is the perfect book for your inquisitive and imaginative child. I usually like to pick up short-story collections in the summer, for quick, no-commitment pool and beach reads. So I’m glad I listened to the advice of the Staff Picks shelves at Women & Children First and purchased Single, Carefree, Mellow, Katherine Heiny’s debut collection. It’s like Girls in book form. Heiny’s heroines are in various levels of romantic distress: mostly affairs, from married men to online relationships. Like all great short-story writers, Heiny has a gift for getting the reader invested in a new cast of characters within a few paragraphs. Her first story starts out, conversationally, “So picture Sasha innocently sitting alone in her apartment on a hot summer afternoon when the phone rings.” Sasha’s saga—it’s her lover’s wife on the phone, wanting to have a drink—quickly unfolds from there. Other stories feature roommate crushes and awful in-laws and bridezillas and any number of easily relatable social situations, especially in the female universe. After one of Heiny’s heroines ends her online affair, she uses the opportunity to stay in the moment, instead of departing for fantasy: “So Josie tries not to go somewhere else in her head… She stays right here in the conversation like someone standing on a rock in the middle of a rising creek, because conversations like these are the only kind she has now.” Heiny’s journeys into her character’s psyches add unexpected depth and revelations, making this collection of witty relationship portraits a compulsive page-turner.